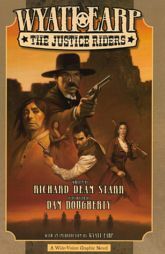 History meets adventure in a hell-raising tale of Western justice! Wyatt Earp thought he was settled in as sheriff of Ford County, Kansas when a mysterious letter arrives that pulls him away from his new life in Dodge City. With the help of his friend Bat Masterson, Wyatt recruits the infamous Apache warrior Geronimo. Together, they head for a destiny forged in blood and bound by honor. Along the way, this unlikely duo is joined by three other famous old-west characters: Bell Starr, Annie Oakley, and the Cisco Kid. Each of them has their own reason for riding the trail, but their ultimate goal is the same: a heart-pounding quest for justice deep in the heart of the New Mexico desert. An action-packed graphic novel of what might have been. 103 Pages Black & White. Written by Richard Dean Starr. Illustrated by Dan Dougherty. With an introduction by Wyatt Earp.